This marks the beginning of your formal relationship with our congregation. You join the community for special occasions and explore how we live. You continue your study or career and live independently. This period of exploration lasts six months to a year. During this time you live, work and pray with a local community of Presentation Sisters. This is an opportunity for you to grow in self-knowledge and in relationship with the sisters and with God. Candidacy lasts from one to two years. This stage begins the formal study of Presentation spirituality and mission. You use the title “sister” and continue to deepen your faith life, study the vows and live in community. The novitiate lasts two years. Following novitiate, vows of poverty, chastity and obedience are professed for a period of three years. During this time you live in community with other Presentation Sisters, ministering or continuing your professional preparation. At the conclusion of this time, you may request to renew your vows, to profess your vows permanently, or to return to your former lifestyle. Whatever your decision, you will have enriched yourself spiritually and psychologically. 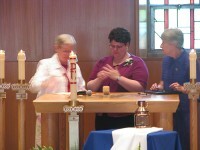 After living in temporary vows for three to six years, you make the decision to take vows to live the rest of your life as a Presentation Sister. This follows prayerful discernment by you and the congregation. 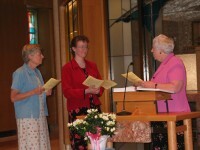 As Presentation Sisters, our lives are shaped by the vows of poverty, chastity and obedience. These vows allow us to serve God in a unique way. Within our vow of poverty we agree to share income and possessions in common. Living a life of simplicity and pooling our resources challenges the view that material possessions alone bring happiness. Our detachment from preoccupation with goods and security frees us to witness to God’s loving care for the poor. Within our vow of celibate chastity we express our love for one another and the people of God. This enables us to focus our hearts and energy on God in the service of others. Compassionate love for each other in community and for all people of God is our primary witness in the Church. Through our vow of obedience we listen to one another and to God in personal and shared prayer, dialog, and in supportive community life. We respond to God’s word for the common good of all. And we integrate our personal gifts into the congregation’s mission in the Church.